Just because a luminaire is utility-grade doesn’t mean that it can’t be beautiful, or deliver beautiful light. Many manufacturers offer an additonal lens option designed to reduce glare, but at Evluma we don’t think you should have to pay extra, or perform an additional maintenance step, to achieve visual comfort. 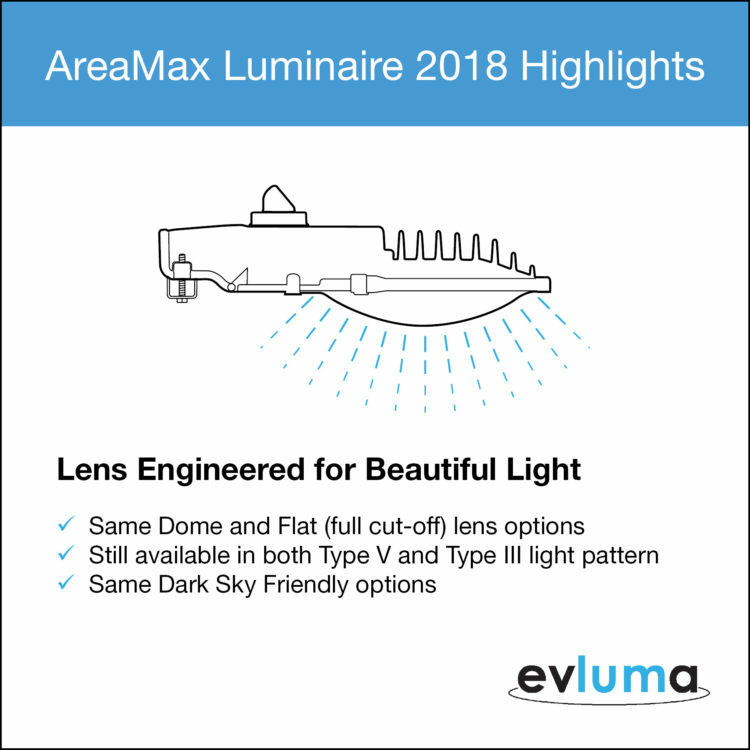 In 2013 when the AreaMax won a Next Generation Lighting award the judges commented that they “…appreciated the excellent glare control of the AreaMax,” noting “that it would be particularly well suited for residential applications.” When we choose to update the light engine of the AreaMax in 2018 we kept sight of this distinction. Low perceived glare shouldn’t just apply to residential applications. Today, with the increase in lumen output and the addition of 80W and 100W models, the AreaMax is suitable for more even more roadway and residential applications, all while maintaining the soft, diffuse, beautiful light our customer have come to expect. With the updated release all models of the AreaMax are now offered in both Type III and Type V light distributions and come with either a dome or a flat lens. A dome lens AreaMax emits a very limited amount of up-light. This gives the luminaire a slight glow from a distance that is reminiscent of, but never to the degree emitted by, familiar legacy HPS lights. A flat lens AreaMax is recommended for customers looking for a luminaire that emits no up-light. Up-light is defined as light emitted above a 90 degree angle from the luminaire, or U0, if you are using the BUG rating. If you have a lighting ordinance that calls for Dark-Sky Friendly or IDA (International Dark Sky) complaint lighting you may wish to choose an AreaMax with a flat lens. Another component to Dark-Sky Friendly lighting is CCT. CCT of 3000K or below is recommended. Evluma has offered IDA certified AreaMax models since 2013. Certification is currently pending on newly released models of the AreaMax. Certification criteria can change, so if this important to you be sure to ask questions and check with the IDA.